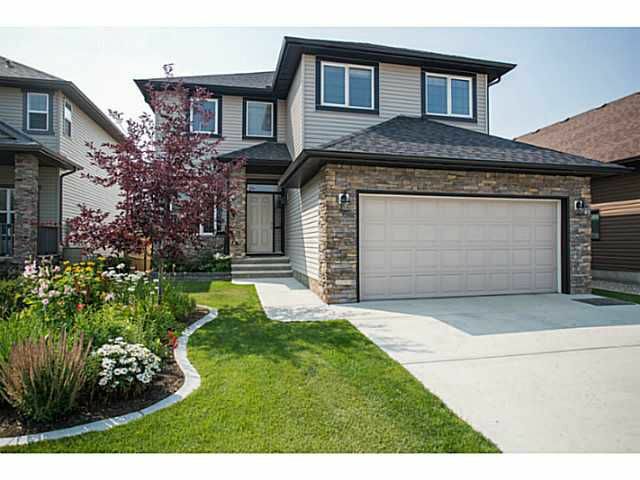 Welcome to this fully finished family home backing onto walking paths & an environmental reserve. The main floor offers beautiful rich hardwood with a walk through pantry to the large kitchen, livingroom with corner gas fireplace & a main floor den, perfect for a home office. The bright, spacious kitchen boasts maple cabinets, granite, large island & stainless steel appliances (fridge is brand new). Upstairs you'll find 3 large bedrooms plus a bonus room & a roomy laundry room. Master offers a 4 pce ensuite & it's own balcony overlooking the reserve. Basement is fully finished with new carpet, 4 pce bath, massive bedroom, large family room & tons of storage. The yard is beautifully landscaped offering a two-tier composite deck, stone patio with firepit, raised garden beds & a 10 month old hot tub. This home is in a great location, close to schools, shopping & easy access to Hwy2. New paint, air conditioning, new carpet - this home is move in ready-you don't have to do a thing. Worth Viewing! Worth Owning!